William Shatner (the original Captain Kirk of Star Trek) returned to Comic Con for the second straight year (Zennie62 trip sponsored by Tout.com), and in talking about his new movie Get A Life, which is a study of Trekkers, found that he was on a journey of discovery that is, as of this writing, still ongoing. We had about 10 minutes with Mr. Shatner, who seems to be an unending source of new Star Trek-related content, and could have talked for 10 minutes more. I’ve seen Bill in two press conferences and he’s appeared at Comic Con, DragonCon, and other “cons” over the past year, and is clearly on a path to not only keep his name a fresh part of the Star Trek discussion, but in the course of doing so, is giving attention to people who are part of the Star Trek universe who have been, arguably, forgotten. 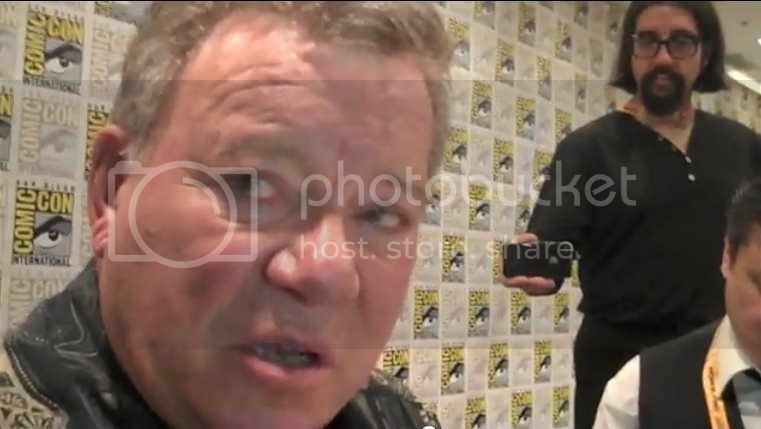 In this video interview, Shatner mentions Mr. Brooks again. In writing this blog post, it occurs to me that William Shatner’s new period of “discovery” with respect to Star Trek might be a reaction to not being in J.J. Abrams new version of Star Trek, the hit movie that came out in 2009. While Leonard Nimoy (who’s also managed to keep his image in the public eye) was in it, there was much speculation, then some controversy, and finally the real Captain Kirk (who would have been “Kirk Prime”) was not. It occurs to me now, right now, that Shatner’s hurt by this, and so these movies, both The Captains and Get A Life, just might be psychological reactions to being rejected for the one Star Trek movie he should have been in. We didn’t get a chance to talk with him about J.J. Abrams’ Star Trek II movie in production, but I am going to venture a guess that I hope I’m wrong about: Shatner’s not in that movie either. Something’s back there driving Bill. I do hope he’s in Star Trek II. Stay tuned for part two on this video interview. I also apologize for the recording glitch toward the end of the video – that’s the first time that happened, but it seemed like I had more than one weird technical problem on this Comic Con trip. Still, I managed to muddle through. Be the first to comment on "William Shatner On Star Trek Trekkers, His Movie “Get A Life,” And Discovery (Part One)"